The Dean of Travel: Russia is cold! Good to hear from you. Yeah, I miss Tess too! It was good for me to get my dog fix for a couple of weeks, thanks. All went well in Russia, including the most tense part, leaving. You are going to find it to be a very interesting place to explore when you go! All the best to you and the family! Cheers from Mongolia and Happy Holidays! WOW! Absolutely stunning! You are so lucky. where are you going next? I would like to find out. Hope everything is going ok in Russia. I told you it was going to be cold in Russia this time a year, you just have to find ways to stay warm. The dog cried for two full days after you left Denmark, Chris was about to send the dog to Russia to join you. We will be looking forward to hearing from you again. Thanks for the web address, I will take a peek to see how they are doing. How are you and where are you these days? 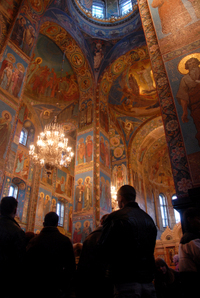 The photo is inside a church in Saint Petersburg. It's now a museum. Yes, it is very beautiful! I will be coming back to Russia one day, it is just to big for one visit! The Cannon is fine; my opinion always has been it is like cutting fine hairs when it comes to the higher end cameras. But, thanks, it always nice to hear some positive feedback from a fellow photographer! I hope all is good back home. Thanks for the post on my blog site, and the kind words you wrote. I’m happy you are taking this journey with me via the Internet. It’s true; I am seeing all kinds of cool things, and experiencing some wonderful moments! I just seeing the cool suff you are up to this day. Is it cool to see all the suff you see . Hi Dean, Keep warm indeed! On the train I took in Kazakstan between Pavlodar & Astana the blankets they furnished were truly warm wool and did the job so long as you kept your feet inside. We chose four bunks over the cheaper six bunk roomette. It's easy to get acqauinted once everyone sorts out their storage spots and settles in. I look forward to your next posting. By the way, Sholpan is in Pavlodar and would welcome you there if it's on your way back... Kazakhstan is a great country with more wide open spaces, steppes. What building are you inside on the second picture? It lookes absolutely beautiful! Have you picked up any Russian yet?